There’s no doubt that Empire has been a success story for Fox. The show has been a ratings juggernaut for the network, and for an entire season, the show continued to show increases in overall viewership on the night the show aired. However, over the course of its Season 2 return, those numbers have dropped a wee bit. Many believe the surge in ratings each week was not sustainable over the long haul, but 50 Cent believes there’s another reason the numbers have dropped a bit: There’s too much gay stuff. The “gay stuff” the post is likely referring to could be Jamal appearing on a British talk show hilariously titled Spilling the Tea last week, during which he pushed the fact he has a boyfriend who is important to him on the host of the fictional program. For most people, the occasional trials Jamal has to face as a popular gay singer has worked within the context of the storyline, but 50 Cent is not most people. In fact, this isn’t the first time he’s spoken out with anti-gay rhetoric before. Although he’s stated he supports gay marriage and has openly supported Frank Ocean, it’s also been clear that he’s not super comfortable with other people’s sexual preferences. 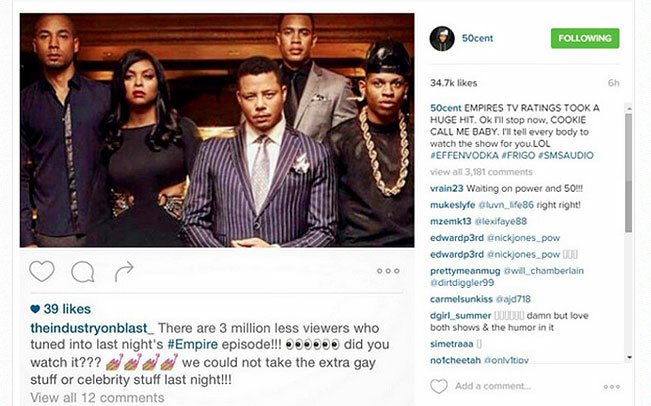 It should be pointed out that Empire has been down in the ratings over the past couple of weeks. However, as more people are DVRing TV than ever and watching at their leisure via DVR, On Demand and a slew of other outlets, Empire’s ratings are doing just fine. After the finale numbers came in for the Season 2 premiere, for instance, more than 22.5 million total viewers had tuned in. That show definitely does not have ratings problems. Empire is some sh!t you should get for free. Now that Power is worth paying for, STARZ premium cable. Thus, it’s a little unclear whether or not this was just another attempt to slam the Fox series. Either way, while his vocal comments have achieved notice, there’s one thing we can say for certain: Despite a slew of guest stars on Empire, we won’t be seeing 50 Cent anytime soon.